Nadia lives in Sderot which is located near the turbulent Gaza border. She has experienced terror and hardships both physically and emotionally. A devastating divorce left Nadia caring for her two severely disabled boys and a small baby alone. The boys’ disabilities worsened and soon daily trips to the hospital were a way of life. Sadly, both boys eventually died. Adding to Nadia’s’s daily stress, a Kasam rocket from Gaza landed dangerously close to her young daughter in their town of Sderot. Miraculously, it did not hit Nadia’s daughter. Even so, the little girl was left so traumatized that she needed coping therapy. With faith like few I’ve seen, Nadia feels the hand of God is the only thing keeping them safe. God has now blessed Nadia with a godly husband, yet the old debts accumulated during her worst trials still heavily bombard the family. The MJIF provided help, and Nadia continues to bless God for His provision. The MJIF works hard to give each of these precious ones a chance they may not otherwise have. Would you pray about sending a donation to help bring hope to those feeling hopeless? NEVER GIVE UP TELLING OTHERS OF YESHUA’S LOVE! Yitzhak and Rachel are an elderly couple that heard about Yeshua from their friends for over 18 years before accepting Yeshua. Several years ago, Rachel and Yitzhak were in an auto accident that broke Yitzhak’s back. Coupled with other health issues and after four months in the hospital, Yitzhak was near death. Messianic Leaders, David & Karen Davis and other believing friends began praying for him and God spared his life. To show their appreciation to the Davis, Yitzhak and Rachel attended a service at Carmel Congregation. That same day they both accepted “this Yeshua” that they had heard about for so long! 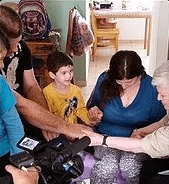 Despite the joy of their faith in Yeshua and improvement in Yitzhak’s condition, this couple continues to face expenses far beyond what their health insurance will cover. Yitzhak needed massive dental work and because of your generous support to the MJIF, we were able to help this elderly couple over a pressing obstacle. Eldad is a Sabra (native born Israeli) that travels to the Congo in Africa with groups to build sturdy houses for the local people. Eldad also brings Bibles and shares the GOOD NEWS of Yeshua with the Congonaise community. On his last trip, Eldad got very sick. The doctors could not find a cause and sent Eldad home to Israel. Again, the doctors could not find the problem. 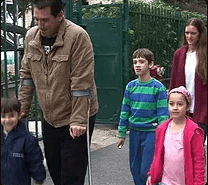 Eldad has been unable to work for eight months and his family is suffering. Finally, with intense research, Eldad’s wife found a specialist who diagnosed Eldad with Gillian Barré Syndrome – GBS. The promise of payment later, the specialist is slowly returning Eldad to health, but it could take six month’s to three years. The MJIF has stepped in to make sure these vital medical treatments continue so that Eldad and his whole family can be fully healed!